The Blue Pearl is Water Tech's highest quality & most affordable robotic cleaner, offering state of the art technology from a name that can be trusted, Water Tech, the pool invention people! Not only is the Blue Pearl priced to own, but it will save you money with each use. The Blue Pearl's Aqua Smart guidance will clean the largest of pools five times more efficiently than conventional robotic cleaners. Targeting debris and problem areas to maximize efficiency, the Blue Pearl will save you time, maintenance, and electricity. Made of the highest quality parts including the industry's best chemical and algae resistant Polyvinyl Alcohol (PVA) brushes, the Blue Pearl can clean any pool surface quickly and effectively. The Blue Pearl will clean the bottom and cling to the sides of your pool with ease, cleaning every surface of most pools in two to three hours. Best of all, the Blue Pearl requires no supervision while it works. Its state of the art obstacle sensor will prevent the machine from getting stuck on ladders or other obstructions in the pool. Coupled with its revolutionary beach entry detector, the unit can stop itself from exiting the water. This powerful Robot Automatic Pool Cleaner can clean your entire IN-GROUND pool in just 3 hours! You don't need any hoses, pumps, suction lines and no installation is required!!! Shuts itself off when your pool is sparkling clean! It has built-in air and obstacle sensors. 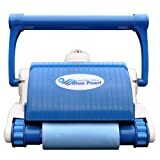 Blue Pearl Robotic Swimming Pool Cleaner, Vac for In-Ground Pools, High Tech Vacuum System 4.5 out of 5 based on 2 ratings.